A web hosting service is a type of Internet hosting that allows individuals and organizations to make their websites and web applications available on the Internet. A Windows Hosting environment is simply a web server that runs on the Windows Operating System, and also provides reliable interfaces with IIS, ASP.NET and MS SQL. Many developers are running applications and hosting web spaces using IIS and SQL using Microsoft Windows Servers. There are many advantages of using a Windows Hosting Service: the interface is familiar and easy-to-use, it offers powerful features and controls via the cpanel, It supports many scripting languages like ASP, ASP.NET, Silverlight, PHP and PERL, It can support various types of web applications from WordPress blogs to e-commerce websites, photo galleries or content management systems (like hosting a Joomla site on Windows Servers) and so on. You may also want to look at hosting your development environments on Virtual Private Servers. Windows VPS Hosting provides virtual servers on the cloud and these are extremely suitable for using when developing large-scale projects. The benefits of using Virtual Private Servers are that they are flexible across all the different types of operating systems and you can have full control over the functions. Virtual Servers are powered by the cloud and you can run them either on Windows or Linux environments, depending on your requirements. Solutions provided by companies like myhosting.com also have what they call a Windows Hyper-V VPS Cloud, which offer several benefits for organizations or individuals who either want to host a personal website or application, want to develop standard web applications or want to develop and host a large-scale business web environment. This is more like a dedicated server just for your needs so it gives you control over the entire operating system. Cloud Computing is the rapidly growing technology that’s gaining in popularity world wide. The concept is simple: Applications and data can be stored remotely on other servers, “the cloud”, and can be accessed from any computer with Internet access. Most of you already use cloud computing but are probably unaware of it, and a good example of this is having a yahoo, hotmail or gmail account. All your emails are stored elsewhere but you can still access them from any computer. This technology has been around for years, but it’s only till recently that companies have started using it more after discovering the potential it holds for many other things. Several organizations use cloud computing and virtual servers to run their applications. This saves them the cost of purchasing the actual software. Most cloud computing services are charged based on the “pay as you go” model whereby you only pay for the resources you use; others however charge a flat rate regardless of the amount of usage. Cloud computing also reduces hardware costs as you can use servers on the cloud to carry out the tasks you need. It’s a great revolutionary technology and is spreading like fire through all sorts of organizations! Despite the immensity of this cloud computing era, there are however various concerns about the security and privacy of the data stored on the clouds (remote servers). These issues are normally dealt with the private cloud solution provider. They should be reliable for ensuring secure access and prohibiting unauthorized access to their servers. Having said this, it’s probably a mission looking for the right providers of cloud computing facilities. Adequate research has to be carried out to find out the reliability and trustworthiness of any private cloud provider before making a deal and letting a third party handle any confidential company information. If you’ve had any experience of using cloud computing services, do leave a comment and tell us about your experiences! Cloud Computing: The New Buzzword! 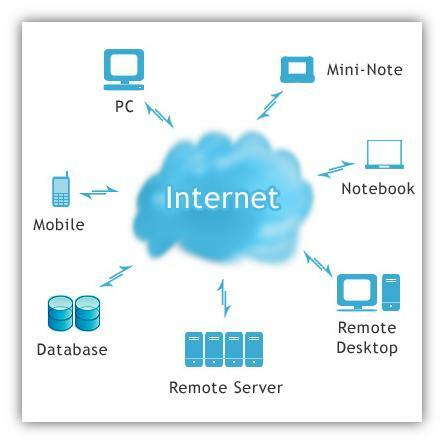 A new type of Internet Technology that uses remote servers to control and maintain data and applications, Cloud Computing allows individuals and organizations to access their files, use remotely installed applications and work from any computer that’s connected to the Internet. Cloud Computing is a form of Software-as-a-Service (SaaS). In simple words, it’s where applications are hosted on remote servers and provided to their clients as a service. It eliminates the need of installing and running software on the clients’ computers, hence saving them the costs of buying and renewing software licenses. Cloud Computing opens up many opportunities for businesses as it brings down their costs in investing in software and maintenance of programs and storage facilities. The list of services provided on a ‘Cloud’ is everlasting and businesses are taking advantage of the scalability benefits they get from Cloud Computing. The most popular service provided to businesses through Cloud Computing is Customer Relationship Management (CRM) systems. It’s the rule of any business: if the customers are satisfied, then the business is rewarded. Cloud Computing provides a means of streamlining business processes and allowing employees to be more productive and efficient at their work. There is a website I stumbled upon while doing some brief research on Cloud Computing: it has so much information on how businesses are taking advantage of this technology and what other services are provided on a ‘Cloud’. If you’re looking forward to implementing cloud computing, all the best! Hope you all find the technology very useful! !